Deutsche Welle journalist and Cricket Germany batsman, Andre Leslie (@andreleslie) joins Andrew Nixon (@andrewnixon79) and myself. 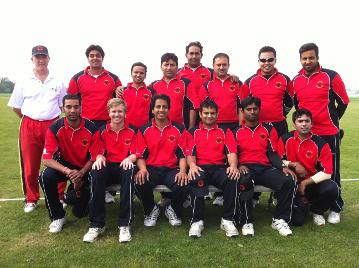 We talk about the World Cricket League Division Seven, cricket development in Germany, particularly the difficult aim of promoting cricket in the local media, and discuss his hopes for European Division One in July. In the news: we note the proliferation of tours to full member nations, and chat about the distribution of TAPP funding and ICC priorities. Direct Download Running Time 41min. Music from Martin Solveig, "Big in Japan"
In many sports, as you mature as a player, you realise that the way to win is not to beat them, but to let them beat themselves. And vice versa. Zimbabwe beat Bangladesh two years ago by grinding them down - they played a competitive match against Pakistan doing the same. Led by Brendan Taylor's 171 (324) and	102* (146) they worked up a competitive but not great score. They lacked that bowling on the second day, conceding 1/95 off 25 overs. But Jarvis 4/40 and Masakadza 4/32 destroyed Bangladesh on the third morning, taking a scarcely credible 9/32. From there, notwithstanding concerns about Bangladesh's recent batting efforts, a win was inevitable. Bangladesh again failed to produce even a half-way respectable total. They are better than that, even in unfamiliar conditions, and need to find a workable approach in the few days available to them. For Zimbabwe, a welcome win after successive slips in their ranking, and a very comprehensive one that wil give them a lot of confidence. A evenly poised match throughout, only, finally, going the way of the home side when Tom Cooper was dismissed just after tea on the final day. The Netherlands went into the match needing to win and got a nearly perfect start; ven der Gugten (7/68) taking out the top order. Namibia swung the game back their way via van Schoor (110) and Burger (71) but lost late wickets and made only 276. Netherlands, by contrast, started very well, reaching 1/157 (Cooper 83) before a slow-motion collapse left them 14 runs short with only one wicket in hand. The final pair put together 31 to take first innings points, but Namibia kept coming. The depth in their batting - they carry seven or more all-rounders into many games - meant that even though Baard top-scored with only 85, they still worked their way to 336, a defendable total, with a day to play. Cooper (109) was again the best player, but he had little support and Scholtz 5/58 became the decisive and final contribution in the match. The win means Namibia are well placed to make the final, with a game against Afghanistan providing the perfect opportunity to move into second. Netherlands can, in theory, still make the final, but would require everything to fall their way. With direct world cup qualification a real possibility their focus will rightly be on those four matches. Our most complex show to date. Andrew Nixon (@andrewnixon79) and I get a couple of perspectives on the Asian T20 Cup, first from Somesh Verma (@someshverma), editor of Cricket Nepal and writer for the Kathmandu Post, discussing cricket in the host country Nepal; then ACC media manager, Shahriar Khan (@shahriarwork) looking at the broader Asian region. In between Andrew chats to assistant editor of the Wisden Almanack (@WisdenAlmanack) James Coyne about the Cricket Round the World Section in this year's edition. In the news: John Mooney's unfortunate tweets, the city of Lauderhill considers other uses for its cricket stadium, and Namibia's quota system. Peter Della Penna (@peterdellapenna) joins Andrew Nixon (@andrewnixon79) and I again to talk about the Americas Division 1 held in Florida, news and events in US cricket, and the upcoming World Cricket League 3 in Bermuda. We preview the Namibia-Netherlands I-Cup and WCL Championship games, and wrap up the news from the Asian T20 Championship. Direct Download Running Time 1h20min. Music from Martin Solveig, "Big in Japan"
After at least forcing the West Indies to bat twice in the first match, Zimbabwe were easily subdued in the second, collapsing to the spinners twice over for 175 and 141. 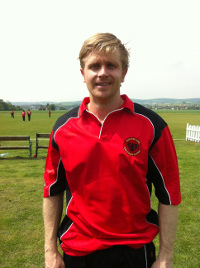 Shllingford took 10/93 for the match, but they also lost 6/50 against Samuels. Gayle (101), Chanderpaul (108) and Ramdin (86) made runs, and the West Indies ought to be concerned that they remain dependent on the two elder statesmen. But there is little else to be said about a match played for low stakes where the home side was so dominant. The final test match of the summer ended up being probably the best. Led by Fulton (136) and Williamson (91) New Zealand ground out a score over five sessions. Finn took six wickets, but mostly in the tail, as England fought back from taking 1/250 on day one. England played fewer poor shots than in the first test but were undone by good bowling instead as Boult (6/68) and Southee (3/44) showed that movement troubles all batsmen. For the second, and not last time in the match, New Zealand let slip an advantage as Prior (73) rescued them from 5/72 to 204. The follow-on was not averted, and New Zealand pushed along at a reasonable crop with Fulton's second ton of the game and McCullum hitting out. But those small advantages proved decisive in the end. So too did catching, which was awful from the home side as they pushed for victory. England rode their luck through 143 overs - a full 57 of them after the fall of their sixth wicket - ending 9 down for the fourth time in recent memory. Prior's 110 was the biggest run contribution, but Bell's 77 off 271, Cook's 43 off 145, Root's 29 off 79 and Broad's ridiculous 6 off 77 were all necessary. The draw represented a significant lost opportunity for New Zealand to post a major series victory after several years of weak results, For England it is both a lucky escape and a warning sign that without Swann and Pietersen neither their batting nor bowling is close to being as strong as their rating suggests. The return series will be watched in the looming shadow of the Ashes, but with the New Zealand leg turning out to be indecisive, both sides have much to prove. A dead rubber, and one noone expected Australia to win, or even be terribly competitive in. On a difficult pitch that Australia again had the best of, it turned out to be an intriguing match, up until the point when the inevitable third innings collapse carried a win out of the tourist's reach. There were, arguably, only two players to come out of the match with any credit at all. Siddle top-scored in both innings with 50s, and Lyon finally produced the spell he is capable, taking 7 (somewhat expensive) wickets for 94. Ashwin's 5/57 in the first innings and Jadeja's 5/58 in the second did for Australia, and while Cowan and Smith produced knocks of grit in both innings, neither scored the runs needed. India's batsmen performed only marginally better. Pujara stamped his class with 52 and 82, but a 6 wicket victory against a rabble in favourable hom conditions isn't brilliant. The struggles of Tendulkar loom larger with every faltering innings. With Sehwag and Gambhir moved on as well, this series represents a significant changing of the guard for the Indian batting. The youth demonstrated that they have plenty to offer - certainly more than their opposition - but much more will be demanded of them in the near future. For Australia, they need to regroup and recuperate. Their rating has now fallen out of the top-three for the first time since 1990, such is their plight. With Clarke, Pattinson, Bird and Starc all injured, all the players most likely to salvage something in England are in traction in the leadup. Every other batsman has a question-mark over their head; yet so degraded has the Sheffield Shield become as a sign of form that perhaps only Hughes (5th) and maybe Khawaja (17th) will line up out of the top twenty run-scorers in the past season. It is possible Australia does actually have the players to beat England. It is too late to find out if that might be the case. A series that should mean much more to both sides than a monumental financial loss. The last series, only two years ago, was close and competitive, and in the proper structure it would represent a great chance to show each side in a good light. Instead its most obvious result is that it ruins the chances Shakib al Hasan and Tamin Iqbal had of a decent IPL pay-day, and will further bankrupt the impoverished Zimbabwe board, once again fighting the players over lack of match payments (very small match payments at that), and shedding players to the English leagues. With Shakib not bowling, Zimbabwe are a reasonable strong chance of scoring enough runs to make a game of it. The loss of Ervine makes that less likely, but if they can show the same patience as in their last encounter then their bowling is good enough to force victories. Bangladesh came out of the Sri Lankan series with a lot of credit, and it will be equally interesting to see how they manage on African pitches. With no other cricket on, it is a series worth watching. A close match where both sides batting vulnerabilities were exposed, but the African side's depth stood out. Canada made a decent first innings score (358) anchored by Kumar's 89, but Kenya's response was slightly stronger, going past the Canadian total six down, with another young batsman, Rakep Patel, scoring 130. In the second innings, with at least a draw for the taking, Canada collapsed and only Hiral Patel's 93 kept them from complete disaster. Odhiambo's 5/43 was the standout bowling performance, and it won them the game, even if Hiral Patel's 4/41 caused a few jitters in the chase of 128. Kenya put themselves back in contention in the I-Cup with the victory, although they'll need both wins and favours to make the final. Canada slip to last in both tables, and the prospect of losing their status in the world cup qualifiers looms larger with every loss.